Forsaking the worldly pleasure in his tender years Sai Baba came to Shirdi with a mission that sprang from the source of his free and redeemed spirit. 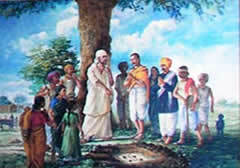 His mission was self-allotted and that was to awaken the mankind to his true self and divine nature. He wanted to lead them to salvation by saving them from delusion and ignorance. Such is his benevolence that Sai Baba stands there eternally extending his helping hand to give solace to his children who are suffering and leading a wretched life devoid of any hope. With the whole world under benevolence Sai Baba inspires an undying hope among the mankind. Thus, it is his sacred mission to awaken, elevate, transform and comfort his children. These may be the tangible missions of Sai Baba that ensure harmony all around. However, He had several bigger missions as well that encompassed the whole of universe and its administration including creation, sustenance and destruction. Ultimately, the mission of Sai Baba was to evolve human beings to the state of godliness, i.e., realizing the spiritual body in the mankind leading to their complete redemption and salvation. His powerful assurance 'Why fear when I am hear' has been the great source of strength among the ever growing number of Sai Baba's devotees.